SCA has taken action to improve Norrland’s only location where the Zygaena osterodensis moth thrives. It is testing various methods and hopes these will increase the number of moths. Zygaena osterodensis has found refuge in a small frosty glade near the E14 motorway in Borgsjö, Ånge Municipality. The glade covers about one hectare and due to summer frost the forest has not grown there but the area remains open. “The glade is, however, gradually becoming overgrown with grass, that is slowly displacing tufted vetch, a plant the moth’s caterpillars need to survive. The main source of nectar for adult moths is also disappearing as the number of wood cranesbill flowers decreases,” explains Tomas Rydkvist, SCA’s nature conservation expert in Medelpad. Last summer, SCA’s nature conservation experts in Jämtland and Medelpad met Nils Hydén from Linköping, who is the leading expert in Sweden on Zygaena osterodensis. The meeting was held to find out what forestry methods were needed. “We were given several suggestions and are now applying various methods on half of the frost glade,” says Tomas. In early autumn, a quarter of the frost glade was cut using a scythe mower in an endeavor to improve conditions in the area. And in October, work began to dig rows of mineral soil. “We dug a number of 20-meter long and 1-meter wide mineral soil rows in an irregular pattern. Hopefully this will increase the presence of tufted vetch, wood cranesbill and other sources of nectar. We placed the rows so they will not impact the juniper shrubs growing in the glade. The shrubs are important in providing shelter for the moths when it is too sunny or hot,” says Tomas. Next year, we will follow up the measures to see if there are more Zygaena osterodensis moths. 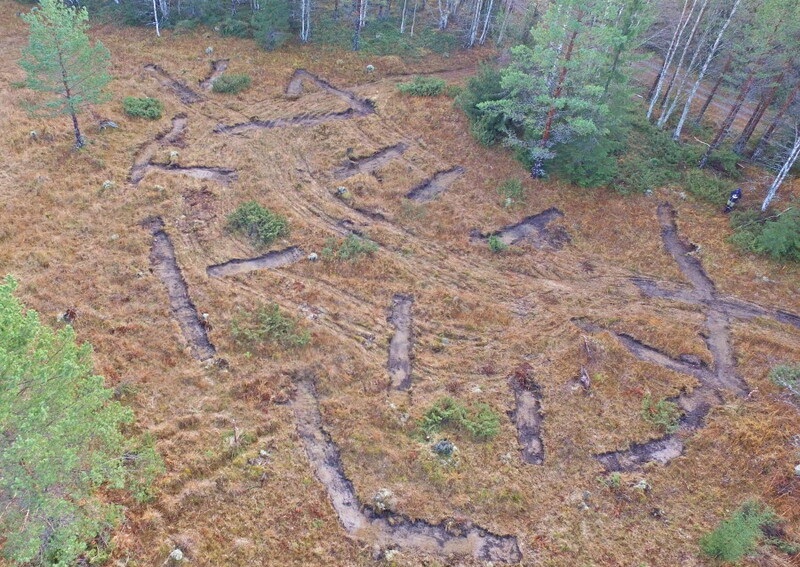 The pattern of the mineral soil rows is very visible in the drone images taken when work was completed. Photo: Joshua Johansson. 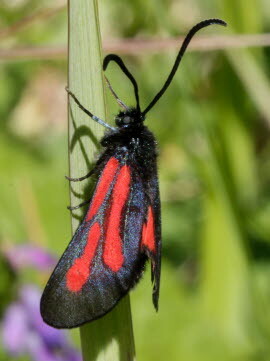 Photos of Zygaena osterodensis moths by Tomas Rydkvist.